C/ Puig de Teix, 4, 07180 Santa Ponça, Spanje. 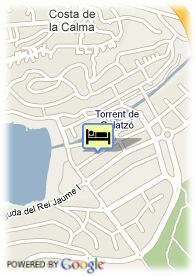 The Complex includes the Hotel Pionero***, Hotel Santa Ponsa Park*** and Hotel Playa Santa Ponsa**. Guests can enjoy all the services offered in these Hotels. They all have comfortable air-conditioned Lounges, Bars, and T.V. Lounge via satellite, swimming pools for adults and for children, solarium, conference room, tennis, and gymnastics. Comfortable rooms. The Hotel disposes of non smoking rooms. Our international entertainment team takes care of the day and evening activities, organizing games and several sports competitions for all ages. In the evening, several shows and parts of famous musicals as well as all kind of activities.